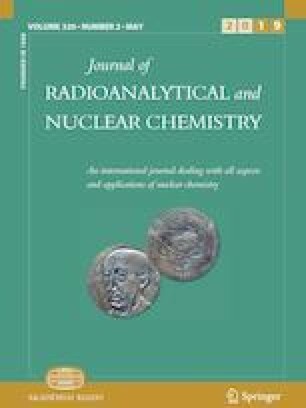 The radioactive iodine volatilization inhibition of cyclodextrin and the influence of radiation on this effect were evaluated by observing the change in the radioactive iodine-131 (131I) retention rate in an aqueous solution containing cyclodextrin as a function of time. The retention rate was found to be 1/3–1/4 that of an aqueous solution without cyclodextrin. The 131I retention rates remained consistent even after exposure to high doses of radiation up until 30,000 Gy. Cyclodextrin was thus found to be effective for inhibiting the volatilization of radioactive iodine. This work was supported by the Japan Society for the Promotion of Science (JSPS) through a Grant-in-Aid for Scientific Research (C) (No. 15K00581). We are also grateful to Shinshu University and The University of Tokyo for providing the laboratory and to CycloChem Bio Co., Ltd. for providing us with several cyclodextrin samples.